The bottom of the foot contains a band of tissue called the plantar fascia that spans from the heel to the pads of the toes. When this band becomes irritated and inflamed it can produce uncomfortable pain in the heel called plantar fasciitis. While this is not the only possible cause of heel pain, it is the most common source. 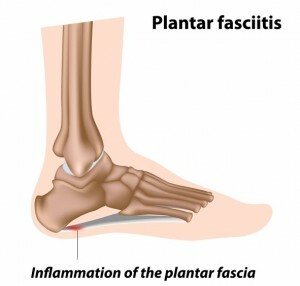 Heel pain caused by plantar fasciitis, also sometimes referred to as heel spur syndrome, is caused by irritation to the plantar fascia, which results in painful inflammation. Most often, this condition is due to your foot structure, specifically those individuals who have flat feet or high arches. Typically, pain from plantar fasciitis will gradually worsen over a period of months. While it may be especially painful in the morning, symptoms usually improve slightly after walking around, as this helps to stretch out the tissues. What are the risk factors for plantar fasciitis? What are the treatment options for plantar fasciitis? If you are experiencing chronic heel pain, call our office at 212‑434‑4920 or fill out the schedule appointment form on this page so Stuart Katchis, M.D. can evaluate and diagnose your condition. Plantar fasciitis is fully treatable without surgery for most patients and treatment outcomes are significantly improved if medical evaluation is sought when symptoms first start. Nonsurgical treatment options may take several months to fully take effect, depending on the course(s) of treatment taken and how long you were experiencing pain prior to seeking medical attention. Applying ice to the injured area will help reduce pain and inflammation. Taking over-the-counter anti-inflammatory medications can considerably reduce pain. If necessary, Dr. Katchis may prescribe a stronger medication to help with inflammation and pain. Wearing shoes that offer soft, supportive soles with a slightly raised heel will stabilize the injured foot and reduce strain on the plantar fascia. Inserts placed in the shoes can help relieve pain by repositioning the foot and reducing pressure on the heel and plantar fascia. A splint can help position the affected tissues in a stretched position during sleep so that pain is not as severe in the morning. Cortisone shots injected into the affected area may significantly reduce pain and discomfort. There are a number of stretches and strengthening exercises that can aid and sometimes even accelerate the recovery process. Dr. Katchis may recommend that patients see a physical therapist for treatment. If plantar fasciitis is a chronic problem, sound wave therapy may be implemented to stimulate healing. If conservative treatment options do not relieve symptoms after several months, Stuart Katchis, M.D. may recommend surgery. While rare, a surgery may be performed that permanently detaches the plantar fascia from the heel bone to eliminate severe pain. What does the recovery process entail? Recovery times will vary depending on the severity of each patient’s condition. Whether you undergo nonsurgical or surgical treatment for plantar fasciitis, Dr. Katchis will provide recommendations for long-term measures designed to keep your symptoms from returning, such as footwear modifications, wearing orthotics and performing regular stretching exercises.